Insitu testing of soils has become widespread in recent years due to its cost effectiveness and convenience. Two sophisticated devices for performing insitu tests are the pressuremeter and the dilatometer. 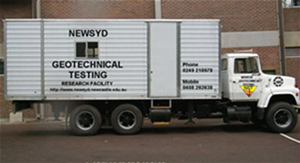 Both of these devices are being studied in major research programs using the truck mounted testing facility NEWSYD.